News for my 100 day anniversary!!! 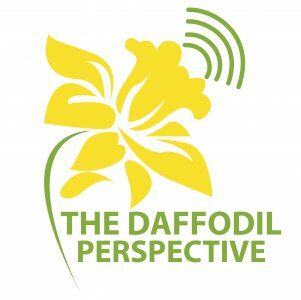 Today is 100 days since the 1st broadcast of The Daffodil Perspective, and to celebrate I’m taking it to the next level, so much exciting news to share. 1, I’ve launched my brand new logo everywhere. I think it looks really cool! 2. Also got a brand new and improved home page. Read all about my mission here. 3. I’m pleased to announce Contemporary Corner has its first monthly residency with PARMA Recordings! On the 3rd Tuesday of every month I will be showcasing a single composer album by one of their awesome composers. This is starting on the 19th March. 4. Im also excited to announce I’m now a contributor on Women in Music Blog, a fantastic organisation started 30 years ago by composers Odaline de la Martinez, Nicola leFanu and others to support and promote women working in the arts. Fingers crossed to be a full member soon too. Next week on the show I’m very excited to feature the music of Lucy Hollingworth, a brilliant composer and by happy coincidence a trustee of Women in Music. 5. I wrote a guest blog on Dame Elizabeth Maconchy for Illuminate Women’s Music, another trailblazing organisation supporting and promoting women composers. We have a great relationship and I’ve been pleased to feature some of their live recordings every month on the show. Check out my piece on Maconchy and find out more about Illuminate here. They will be playing music by Maconchy at the Royal College of Music on Saturday 16th February, a concert not to be missed. 6. This week Women’s Philharmonic Advocacy mentioned my blog post on their Monday Link Round up. Check it out and find out about their amazing work here. Shout out to them and all the work they do seeing music by women gets performed. 7. I’ve been playing Florence Price a lot on my show so I’ve decided to make my celebration of her official, introducing Fun With Florence! Every month I’ll be showcasing a different piece by this amazing woman along with sharing her story, what inspires me so much about her and a few lessons she can teach us. That will be happening on the 4th Tuesday of every month and I’m starting with a very special recording from pianist Samantha Ege, a fellow champion of Price and brilliant interpreter of Price’s music. Her album Four Women was released in November, I was very excited to feature it as my album of the week on the 27th November. Have a listen to Ege’s rendition of Price’s Sonata in E Minor from the album Four Women. 8. I created my first curated Spotify playlist – a basic guide to female composers throughout history starting with Hildegard von Bingen, moving through the eras to the 21st century. Just some of the many awesome women composers. Check it out. 9. Lastly shout to composer Rebecca Rowe, I featured her wonderful Fantasie In Nomine in Contemporary Corner on 29th January. Pleased to get a mention on her site too, she’s got tons of great things happening, check it all out here. 10. That’s almost it, I’m planning on starting more regular blog features including updates on new releases, upcoming events and various curated playlists. Few more things in the works, will drop them as soon as I can. Check out my Facebook page and Twitter for updates. Here’s to a more gender balanced future!